Capt. 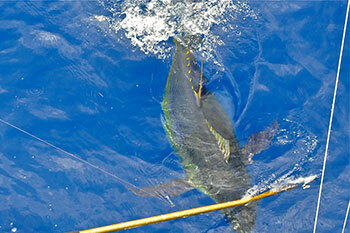 Price specializes in Yellowfin tuna fishing charters from early April through August (prime Tuna season). 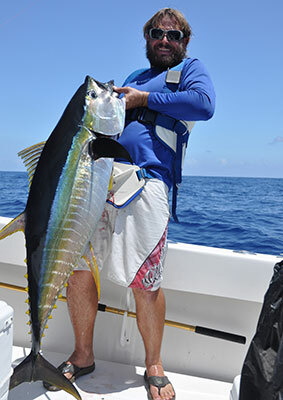 World class charter fishing for Yellowfin Tuna, Blackfin Tuna, Slammer Dolphin and both Blue and White Marlin exists just two hours from the St. Lucie Inlet in Stuart. Tuna , Marlin and Wahoo are also popular catches on our excursions to the Bahamas. Yellowfin Tuna are sometimes confused with Yellowtail due to the yellow-tinge both display on their forked tails. Yellowtails are actually Jacks (related to the Amberjack we find here on the east coast) whereas Yellowfins are a true Tuna species. Situated on the East side of the Gulfstream, in deep seas as close as 60 miles, cold water eddies interact with warm Gulfstream water creating a fishing frenzy second to none. Plankton and bait gather in these eddies providing an endless food source for Tuna, Dolphin, Wahoo and Marlin. When it is timed right this is an amazing sight seeing all the tuna frothing and jumping out of the water just yards from the boat. One good pass, 6 fish on, and the battle for dinner begins. Tuna are an extremely powerful fish testing any angler's skills and strength but the end reward outweighs all the grunt work. 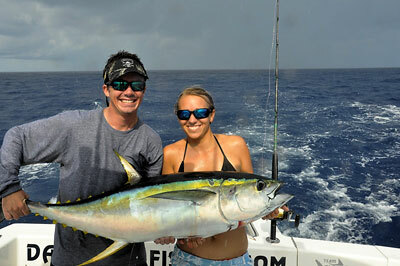 Fishing a Tuna charter from early April through August will give you the opportunity to limit out on Yellowfin Tunas. The average size of a Yellowfin at this time of year is around 40lbs with encounters of 100 plus pound fish common. Dolphin or Mahi-Mahi are a common by-catch to the Yellowfin Tuna and can often become a nuisance. These fish average 25lbs with 50lb fish making regular appearances in the fishing spread. Want to book a Tuna fishing trip with fishing guide Capt. Pat? Call (772) 405-0091. The biggest fish we will encounter on the East side charters are Blue Marlin. I hope to encounter a Blue Marlin every trip. These big guys are there feeding on the tuna and dolphin we are also targeting for dinner. By the end of the season we usually average a bite a trip with great trips having 3 or more bites in a single day. The average size Blue Marlin is 175lbs and is an exciting battle of 50lb stand-up tackle. This past season two anglers battled, caught and released a 500lb Blue Marlin after a two hour fight. Before that we caught a limit of Yellowfin Tuna by 11 in the morning. As well as Tuna and Marlin, we also target other species including Sailfish, Swordfish and Kingfish. Come and get yours! All Marlin are catch and release only. In the later months Blue Marlin are still encountered along with Dolphin but your odds do decrease from the earlier months. 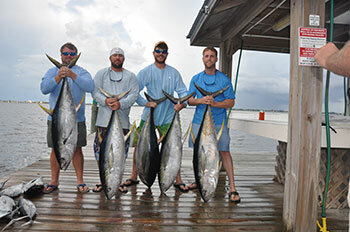 Tuna typically push a little closer to Florida later in the season and some of the biggest Tuna we see are late in the season (July and early August).